The mist drifted effortlessly above the glass-like water. Drips from the oars broke the silence as they rhythmically melted into the lake sending endless miniature waves out in every direction. Dawn was upon me, my favorite time of day. Overhead, I heard a faint whistling sound that grew ever louder. I looked up and saw ten to fifteen mallards, wings set, gliding, tipping, and adjusting in unison, as they lit simultaneously on the water about Twenty-five yards from my boat near the lily pads. What a beautiful sight. Mornings like this were common on Collard Lake in 1973. 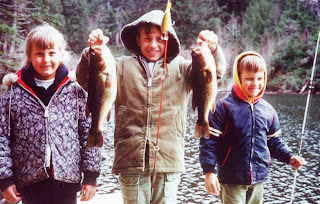 At the age of ten, there was nowhere on earth I would rather be, than in the old aluminum rowboat with my father, stalking that elusive lunker. That trophy large mouth bass that I knew was just waiting in the limbs of the next fallen Doug fir, Cedar, or at the edge of the lily pads just around the corner. Victoria has seen her share of struggles with her own son, but this courageous and caring mother is also and educator, a friend and a mentor to troubled teens from across the country. I got home from work the other evening and my wife was on the phone with the local Pizza place. She asked me if I would go pick up the pizza. So, I got back in the car and off I went to get the pizza. I walked in the door of the pizza place and there was a line of ten or so people. Some were ordering and others were simply there to pick up their pizza like me. The young lady behind the register was very pleasant and spoke in broken English. It was apparent that she struggled to make change, even with the register doing most of the work.